While Union Minister Ravi Shankar Prasad has been fielded from Patna Sahib, Giriraj Singh will contest from Begusarai. Patna: The National Democratic Alliance (NDA) released its second list of candidates for 39 out of the 40 Lok Sabha seats in Bihar at the state Bharatiya Janata Party (BJP) office. 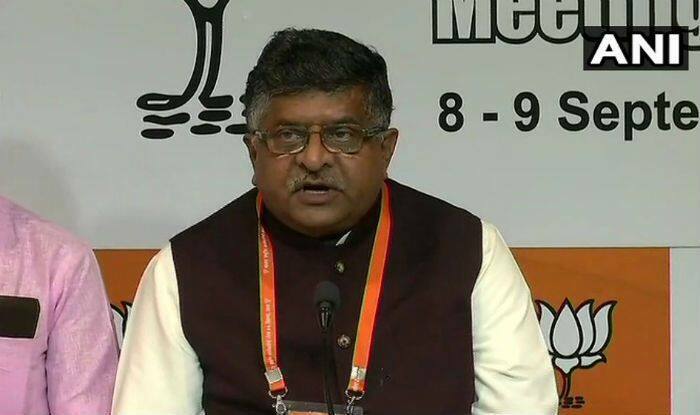 Union Minister Ravi Shankar Prasad replaced MP Shatrughan Sinha and will contest from Patna Sahib. Incumbent Patna Sahib MP Shatrughan Sinha has been dropped from Bihar candidate list for the Lok Sabha elections 2019. BJP leader and former Union minister Rajiv Pratap Ruddy will fight from Saran. Also, Union agriculture minister Radha Mohan Singh will fight from east Champaran while Dulal Chandra Goswami will fight from Katihar on JD(U) ticket. The names of other leaders that were announced by Yadav include- Lok Janshakti Party’s Chirag Paswan who will contest from Jamui, Chandan Kumar from LJP will contest from Nawada, and Giriraj Singh will contest from Begusarai. Meanwhile, Ramkirpal Yadav will contest from Patliputra, RK Singh from Arrah, and Aswani Choubey from Buxar. The NDA list did not release the name of the candidate to contest from Khagaria constituency. Yadav said that Ram Vilas Paswan’s LJP has not yet finalised the candidate for the seat. Bihar BJP general secretary Bhupender Yadav while addressing the presser said the candidates have been finalised by BJP president Amit Shah, Janata Dal United or JD(U) president Nitish Kumar and Lok Janshakti Party (LJP) leader Ram Vilas Paswan. Nityanand Rai, Bihar chief of the BJP, JDU state president Vashisht Narayan Singh and LJP state president Pashupati Paras were present at the press conference. On March 17, the NDA had released its first list of candidates. The BJP and JD(U) are contesting on 17 Lok Sabha seats each in Bihar while the LJP has got remaining six seats. It must be noted that LJP president Ram Vilas Paswan had earlier announced that he won’t be fighting Lok Sabha poll this time.